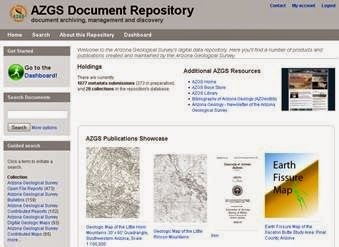 The AZGS’s online document repository delivered more than 27,500 downloads of geologic maps, open-file reports, bulletins, bulletins, circulars and special papers, all in PDF format, during the fiscal year that ended July 31 . The Document Repository is available free, online at http://repository.azgs.az.gov/. Currently, there are more than 1,000 discrete titles available providing more than 1,500 geologic objects – maps, reports, bulletins, and more. This constitutes almost every publication AZGS and it predecessors have produced in the past 125 years.